So it's that time of year when you have to begrudgingly re-evaluate your entire wardrobe and start packing all your summer clothes away. DISCLAIMER: I don't actually do this, but it seems a very organised way of living, but the former is true. I know it's still August, but summer has basically left us and I feel the need to start looking around for more seasonally appropriate clothes. So I've created a good old fashioned wishlist! My main thoughts were, I want to be slightly more covered up but not boring! And although there are a few black pieces in here, they still have an interesting feature to them. 1. Take the black skirt from Topshop. I would never really consider a black skirt as they just remind me of school (even though my uniform was dark green) But they usually look so formal. But with the panel and a-symmetric pleating was a really nice detail. Teamed with a slogan T-shirt or a fitted jumper will take you away from those school-girl vibes. 2. Cosy oversized cardigans is where it's at for autumn and this bright navy coloured one is ideal for layering over jeans and a T-shirt. Now is the time to start investing in knitwear that can last you for a few seasons and this & Other Stories one looks perfect. 3. Next is this denim jacket from I Saw It First. I haven't owned a denim jacket in forever as I cant find one that suits me, but this one caught my eye. 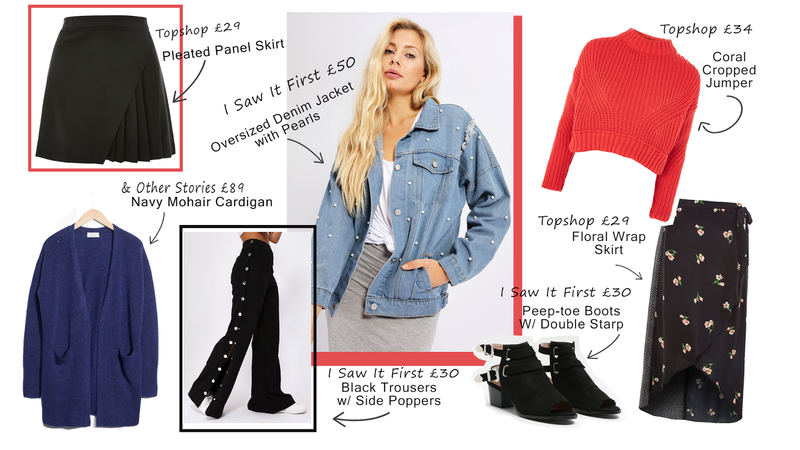 I already have some oversized jeans with pearls on them and I'm not taking about wearing them together, but I thought this could be layered with another warm jumper and not look boring. 5. Just because you want to cover up a little more in autumn doesn't mean your wardrobe should be completely devoid of all colour. This cropped knitted jumper from Topshop is the perfect way to add or keep colour in your wardrobe for the colder months. 6. We all know autumn is for ankle boots, but if you (like me) are not ready to commit 100% to full on stomping boots. Try these open-toed ones from I Saw It First, who are fast becoming a cool new brand to check out fyi! But these look awesome and can be teamed with jeans or dresses. 7. Finally a maxi skirt. I chose this one from Topshop because of the minimal floral print. Floral are not just for spring summer, they can be rocked in winter too and make an amazing staple piece over all seasons.